Built for ready for service and serviceability, these heavy-duty trash receptacles with 40 gallon capacity are rugged and resilient. Popular vertical style slat design steel receptacles with flared top accent featuring a locking side access door and available with either a flat top or rain bonnet lid. The hinged key-locking side door allows ergonomic access to the included steel liner, offsetting the need for any strenuous lifting, making routine service simple and safe. 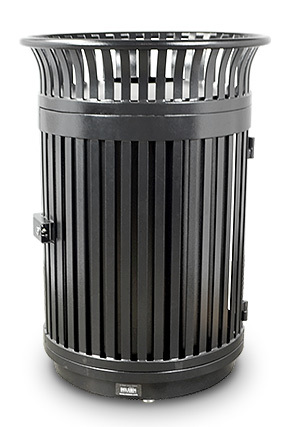 Great for high volume traffic areas, these imported all-steel 40 gallon trash receptacles are finished in a UV stabilized, corrosion resistant powder-coating, promising superior performance throughout the years. Lid security cable and stainless steel surface mount hardware included. ►Need a Flare Top Trash Receptacle Fast?